Background: In 1954 Questar shipped his first production telescope to a customer. Questar's founder Mr. Lawrence E. Braymer (b. 1901, d. 1965), probably had no idea that the company would endure as its product line expanded and developed to encompass many products, each which is considered to be the finest example of craftsmanship and technology that can be fielded. 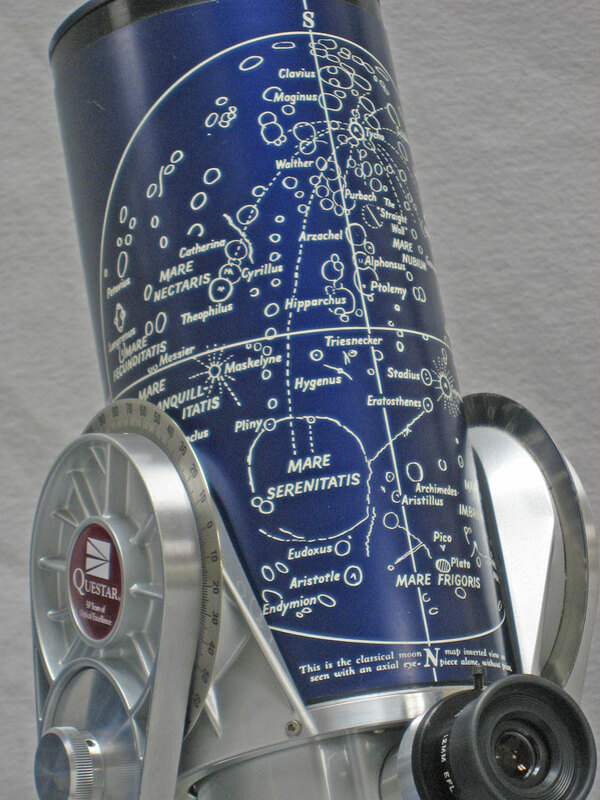 In 1999 the planning began to produce a new limited edition telescope that would celebrate the accomplishment. While Company Seven was consulted, the decisions on how to proceed were made under the leadership of Earlene Austin, President of Questar Corp. It was determined the new telescope would be a deluxe representation of the timeless Standard 3-½ model since it was the first telescope sold by Questar, although over the years some changes were made to keep it in the forefront of performance. The 50th Anniversary 3-½ model production is limited to two hundred fifty (250) units to be sold over the coming years. Right: Questar 50th Anniversary Telescope with Dew Shield removed standing alongside (60,184 bytes). Click image to see enlarged view (175,879 bytes). The first 50th Anniversary 3-½ telescope (bearing Serial No. 001) was delivered at the first Q-Fest event held on 28 September 2000 at New Hope, Pennsylvania. The buyer of the first Questar is an enthusiast who already owned some fourteen or fifteen Questars! Most of those sold have been in response to the color advertisements run by Questar in the astronomy magazines. However, Company Seven did not accept its first 50th Anniversary 3-½ telescope (S/N 74) for delivery until 9 August 2002. We will continue to accepts orders for these telescopes until all planned production are sold out. The Telescope: The Questar is an elegant high performance telescope which combines high technology optics with many convenience features. 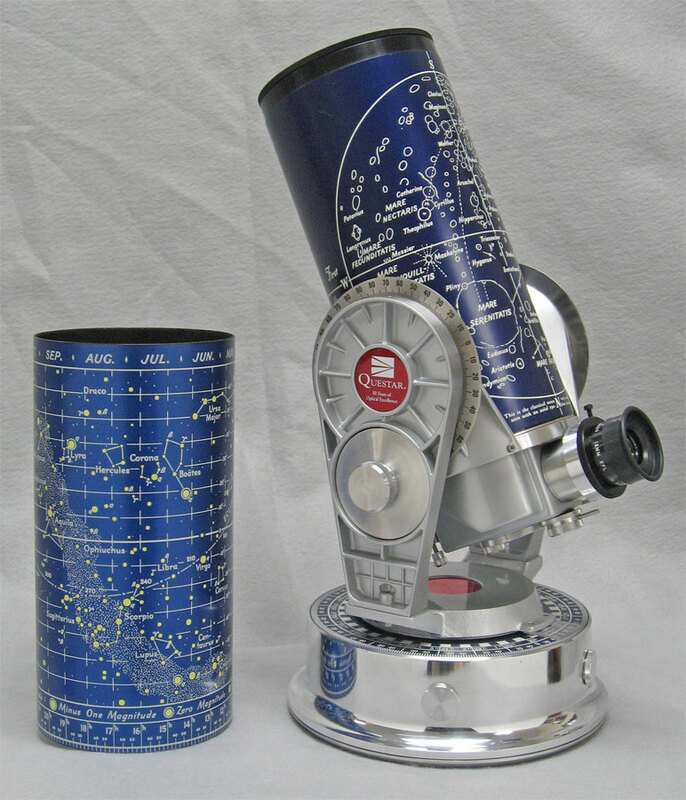 The 50th Anniversary 3-½ model is a fully instrumented telescope where the 3 lb. (1.4 kg) Optical Tube Assembly is attached to a Fork Mount to facilitate use for terrestrial applications, and it can be configured as an astronomical tracking platform too. The Moon Map, the Star Chart, and the Right Ascension Setting Circle are etched and silk screened as was done on the original Questars of 1954. This gives a three dimensional feel and appearance lacking by the modern production telescopes. The Primary Mirror is made of Quartz (Fused Silica) for thermal stability, with enhanced protected Silver reflective coatings. The Corrector Lens is made of the usual Borosilicate Crown, but with a durable Magnesium Fluoride antireflection coatings on both front and rear surfaces. On the Lens Cover, Fork Arms and left side at rear of the Barrel are special 50th Anniversary Model logos. The Questar Powerguide II Drive and Corrector is installed, this is an option for other Questars. The Full Aperture Solar Filter is provided, this is an option for other Questars. The telescope is delivered within the Questar Deluxe Leather Carrying Case, this is an option for other Questars. A personalized Certificate of Authenticity, signed by the owner and CEO of Questar is provided. A second document is provided that is signed by all the of Questar Corporation. Questar 50th Anniversary Telescope bears a serial number with the prefix "50TH" and suffix "SQTZ" indicating it is special. Right: Questar 50th Anniversary Telescope view of front with Anniversary logo centered on Lens Cover (23,047 bytes). then a good case can be made that the Questar is the telescope for the rest of us"
The Questar 3-½ telescopes incorporate the Questar Control Box which is engineered and refined to provide reliable convenience and safety features. This housing at the rear of the telescope provides two viewing or imaging ports (at top or axial), with control levers and linkages providing quick flick knob selection. Left: Questar Control Box (showing from top to bottom): 1. Questar Brandon Eyepiece in Diopter Adjuster - to focus Finder (with two locking set screws), 2. Barlow Control lever - doubles the magnification when rotated into place (clockwise from 10 to 12 o'clock), 3. Finder or Telescope View selector knob (rotate clockwise from 12 to 3 o'clock into "Finder" position or reverse for "Telescope" view), 4. Axial Port - accepts options including Camera Coupling Set or Image Erecting Prism, 5. Focus Control Knob - jewel smooth, 6. Solar Filter for Finder Mirror (knob below and left of Focus knob) dialed clockwise to store Filter. The Dew Shield/Lens Shade with functional Star Chart is visible just ahead of the Control Box. Click on image to see enlarged view (232,764 bytes). 3. High Magnification. Provides about 2X magnification when observing through the telescope; not use able with the Finder. For example one may use the 24mm Brandon eyepiece with the Finder at 4X, then select to look through the telescope at 50X, and then increase the magnification to 80X or more by dialing in the Barlow*. Observing through the any of the three magnifications can be achieved and changed without the observer ever moving away from the eyepiece! * The provided telescope Barlow is approximately 2X, we have seen a range over the years of from 1.6 to more than 2X. Company Seven's testing process measures it exactly, and we provide the information to our customers so that they may make better choices of eyepieces. A focusing eyepiece holder (Diopter Adapter) at the top of the Control Box permits the user to set the diopter adjustment to focus of the Finder for most persons. 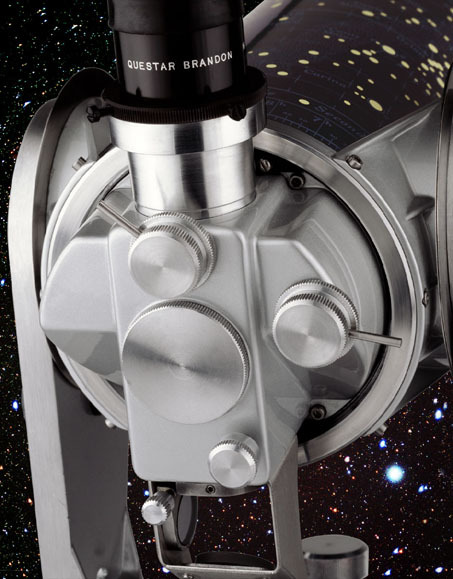 Features within the Questar Control Box include a zenith prism diagonal that can be dialed in or out by the selector knob to move the light from either Finder or Telescope View up to the eyepiece. The eyepiece is installed at a right angle to the barrel thereby making the observing of objects overhead more comfortable. To help place the eyepiece at a more comfortable position for the observer, particularly when tracking in a pole aligned mode, the entire optical tube assembly can be rotated within the fork mount by about 30 degrees clockwise to the right or 30 degrees counterclockwise to the left. To rotate the barrel simply grasp the fork mount with one hand to steady the set, then with the other hand grasp the Control Box to rotate the optical tube. The limit at of rotation is mechanical as the eyepiece holder will be restricted at the length of travel the the stainless steel fin atop either fork tine. The telescope set includes a full aperture glass Solar Filter for the telescope objective providing stunning views of a pleasing orange red Sun with fine details including Sunspots and Faculae. The Control Box incorporates a solar filter for finder lens to facilitate finding and centering the Sun in the field of view of the telescope and to prevent the accidental observing of the Sun through an unfiltered Finder. The equatorial fork mount is made of a brushed cast aluminum which is then lacquered with a clear coat. Each of both axes has a manual friction drive control, the Right Ascension also having slip clutch permitting manual override of the tracking motor. The mount includes the Powerguide II clock drive system useable world wide portable with a 9 volt battery, driven Right Ascension setting circle, Declination setting circle, Declination axis variable clutch lock. The drive is smooth enough to provide flawless tracking of celestial objects for visual applications, although the telescope can easily be accessorized to introduce one into most types of film or CCD astrophotography. The Questar telescope stores into a furnished compact leather clad carrying case (easily "carry on luggage") that has pockets sewn in the liner to accommodate the included tabletop tripod legs, an extra eyepiece, the solar filter, and AC adapter cord. There is also a pocket for the optional Powerguide Controller for worldwide 9 volt D.C. battery powered operation. When you wish to use your Questar 3-1/2 astronomical telescope in the backyard or at a location with no convenient platform to set up the provided tabletop tripod, we recommend you consider a third party good quality rigid field tripod. 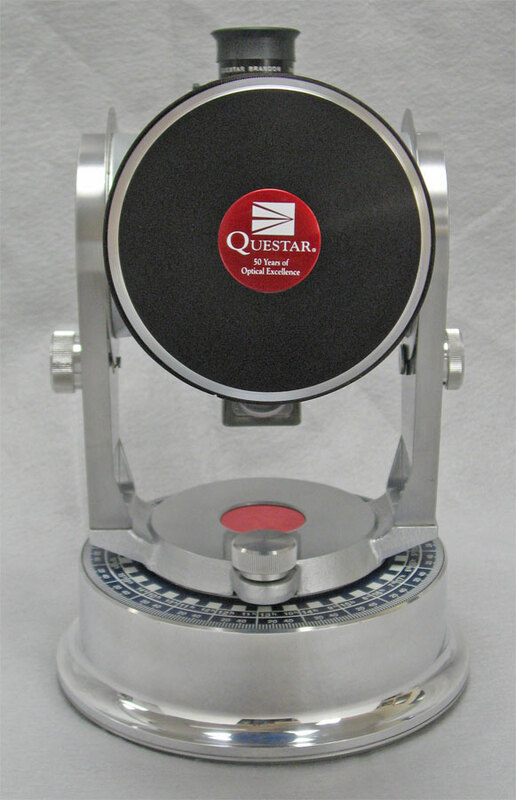 Or for even better convenience, consider our Questar Tristand. The Tristand is a refined, compact telescope equatorial platform and pier that places the Questar 3-1/2 eyepiece at about a comfortable 41 inch (105 cm) height. A taller Astropier is also available. The Astropier and Tristand are suitable for use in latitudes from 26 to 90 degrees, or 4 degrees with the optional Wedge. Weight of Telescope without Lens Cover and Eyepiece: 7 lbs. 7.4 Oz. Weight of Telescope with Lens Cover and Eyepiece: 7 lbs. 11.8 Oz. Right: Questar 50th Anniversary telescope Dew Shield removed to show Moon Chart (60,191 bytes). Click on image to see enlarged view (160,648 bytes). For more information about how to work your way through the decision making process of choosing and specifying a Questar 3-1/2" telescope, the common accessories, and desirable options please feel free to call us, send an E-mail inquiry, visit our showroom, or refer to the article in our Questar Notes/Library section "How to Choose a Questar Astronomical Telescope. ".